A chocolate factory within the UK needed to conform to MCERTS by installing a continuous water monitoring system to measure the flow of three outfalls feeding into a brook. 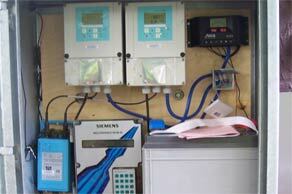 The Siemens HydroRanger 200, the Druck PTX1830 pressure sensor and the Siemens OCM III open channel flow meter. A chocolate factory within the UK needed to conform to MCERTS by installing a continuous water monitoring system to measure the flow of three outfalls feeding into a brook. The goal was to measure the flow rate accurately but with minimal destruction or impact on the environment. fig1. 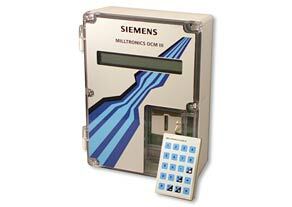 The Siemens OCM III open channel meter. After initial site surveys, RS Hydro decided to use the Siemens HydroRanger at Outfalls One and Two, and the OCM III at Outfall Three. 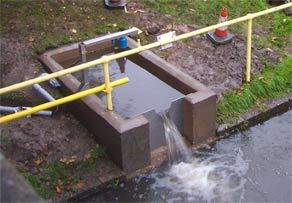 These are both high accuracy flow meters that have passed the Environment Agencies MCERTS scheme. Although these flow meters are usually used with a look-down transducer, this was not feasible or practical in this application, as a distance is required between the sensor and the head of the flow. Our field engineers chose instead to use a Druck PTX530 pressure sensor, screwed into a stainless steel V-Notch plate that were secured over the ends of the pipe falls at Outfalls One and Two. fig3. The equipment used. OCMIII and HydroRanger200.